Probably because the S-T-S construction can be difficult to pronounce for some. But you still can’t laugh. No matter what the context. Because that’s not kind or fair. But it’s SO HARD sometimes!!! You know what? This is the best idea for a one-man show I’ve ever seen. Kudos, Ben Egerman! I’d love to see it live, some day. Thanks for the nice messages. I did end up taking a day off of work. But it was only one day. I’m pretty much back up to speed now. ….and therefore do not have the means to say anything that would have any impact on anyone. Plus I have to go to work in a few hours. I encourage any other admitting physicians with blogs to do the same. I did not actually shave Spoon Avocado. The post was an April Fools’ Day prank. 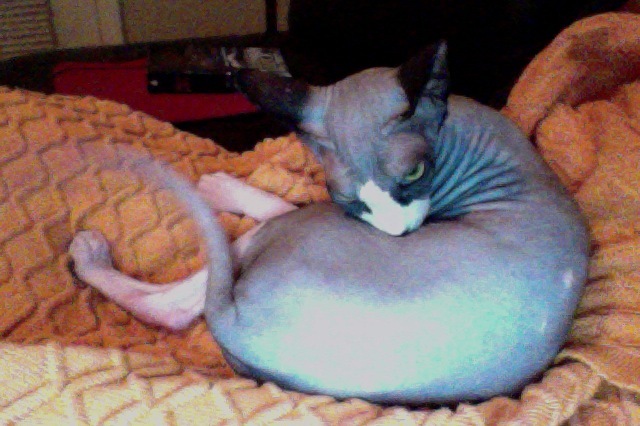 The naked cat pictured is actually a sphinx cat named Harlan, who belongs to my dear friends Lon and Shelley. He was not shaved, either. He just doesn’t have fur. But oh, man! The responses! From my mom, from various concerned readers all expressing…a certain confused and carefully non-judgmental support for my “actions”…. First prize goes to my dad, whose hilariousness is tragically unsuitable for the more *ahem* polite corners of the interwebzes. Third prize to my cousin Julie and her awesome fiance, who thought it was a hilarious solution to the problem EVEN WHEN THEY THOUGHT I HAD SERIOUSLY DONE IT. Fourth prize to Mary Robinette Kowal and Katie for actually figuring out that it was a prank. Lon gets points because it was his cat and therefore he was in on the joke. Mary also gets extra points because, let’s face it: her blog-based April Fools’ Day pranks set a bar so high you just have to reach for it. 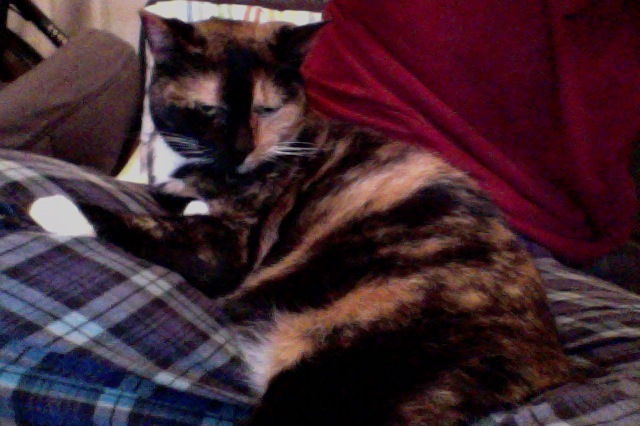 SpAv, on the other hand, is not amused with how much you all have delighted me. When I laugh too hard, my stomach becomes unsuitable for a kitty bed. She just stalked off and is giving me an incredibly dirty look. But I think she can deal. So I Couldn’t Take It Anymore…. Spoon Avocado makes me sneeze like crazy. And she has this horrible hairball problem that has her puking every other day. In short, we’re both miserable. And her fur is to blame for our misery. So I went ahead and shaved her.